This Land Rover Firetruck is sold. This is something for the collector! A super cool Defender 110 V8 firetruck. This Land Rover Defender firetruck was in active duty until a few weeks ago. Even the blue lights still work! A few of the benefits of this truck are that it has always been kept inside, cared for and driven on a weekly basis around the block to keep it ready for when duty called. This is also the reason why there is no rust on the car. This pretty rare truck drives like new. You can get in and enjoy! The Land Rover Defender 110 has been checked and fully serviced, all fluids, oils and filters have been changed. You will drive a safe and fun truck with your family or friends. Missed out on this one? Follow us on Instagram and Facebook to stay up to date and get your hands on the next low mileage Defender. 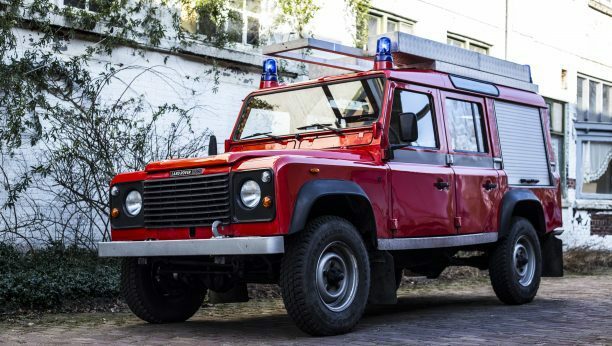 This Land Rover Defender Firetruck is sold.